A thinner but combative Saddam Hussein appeared in court Wednesday for the first time since his hunger strike and hospitalization, complaining that he had been brought against his will and asking to be executed by firing squad if the court sentences him to death. "I was brought against my will directly from the hospital," Saddam told the chief judge. "The Americans insisted that I come against my will. This is not fair." He asked the court to execute him by firing squad, CBS News correspondent Mark Strassmann reported, "not by hanging as a common criminal," if it convicts him of all charges and sentences him to death. As the session began in the U.S.-controlled Green Zone, the ousted president was allowed to make a statement, in which he challenged the validity and impartiality of the court which could sentence him to death by hanging. Saddam and seven co-defendants have been on trial since Oct. 19 in the killing and torture of Shiites in Dujail following a 1982 assassination attempt against him there. The prosecution has asked for the death penalty for Saddam and two of the seven others. "I ask you being an Iraqi person that if you reach a verdict of death, execution, remember that I am a military man and should be killed by firing squad and not by hanging as a common criminal," Saddam said. Chief Judge Raouf Abdel-Rahman reminded Saddam that the trial was still under way and that the court had not reached a verdict. Executions in Iraq are normally by hanging. Saddam then repeated a theme he has voiced since the start of the trial, that the panel is an illegal instrument of the American occupation and is unjust. As he argued with the chief judge, Saddam raised his hands, pointed his finger and said: "Not even 1,000 people like you can terrify me." "The invaders only understand the language of the gun," Saddam said. "I am in prison but the knights outside will liberate the country." Iraqi Prime Minister Nouri al-Maliki insisted Wednesday that Iraq is a front line in the war on terrorism and said those behind the rampant violence in Iraq are perverting the Islamic faith. "I know some of you question whether Iraq is part of the war on terror," al-Maliki told a joint meeting of Congress. A car bomb exploded Wednesday in a residential neighborhood of Kirkuk, injuring 15 civilians, police say. The bombing occurred around 2:50 p.m. in the city's northern Gharnata district, said police Brig. Sarhat Abdul Qadir. There were no immediate fatalities reported. One of Iraq's vice presidents on Wednesday condemned the "unjust Israeli aggression" against Lebanon and the Palestinians. In letters to the Palestinian and Lebanese leadership, Tariq al-Hashimi, a Sunni, said, "I strongly condemn this unprecedented bullying and add my voice to those calling for an immediate cessation of violence." Two brothers serving in Iraq's police forces were killed Wednesday when a roadside bomb struck their vehicle as they returned to their home in southeastern Baghdad, police said. Gunmen abducted the Interior Ministry's residence director, Brig. Abdullah Humoud, as he rode in an unmarked car Wednesday. It was not clear who seized him, police said. Seeking to escape that violence, about 2,480 families, or 14,900 people, have fled Baghdad's Dora, Jihad and Abu Ghraib neighborhoods for Wasit province, according to immigration and displacement officials in Kut, about 100 miles southeast of Baghdad. Saddam was last in court June 19 when chief prosecutor Jaafar al-Moussawi asked the court to impose the death penalty on the former ruler and two others. He was rushed to hospital Sunday on the 17th day of a hunger strike launched to protest the trial and demand better security for the defense team. The hunger strike and the lawyers' boycott followed last month's kidnap-slaying of defense attorney Khamis al-Obeidi, the third defense attorney slain since the trial began. The defense has accused Shiite militias for the killing. 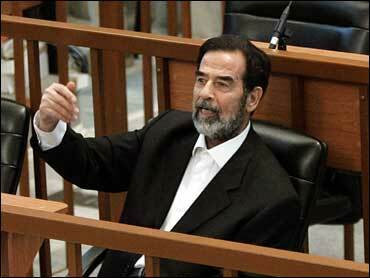 During one of Saddam's outbursts, Abdel-Rahman accused the ex-president of inciting violence against Iraqis. Saddam responded: "I am inciting the killing of Americans and invaders, not the killing of Iraqis. I am Saddam Hussein I call Iraqis to be in harmony and work on evicting the invaders." The judge told him that insurgents are killing an average of 60 Iraqis every day, and only two Americans. "Why are they attacking Iraqis in coffee shops and markets? Why don't they go detonate themselves among Americans?" the judge asked. Saddam replied: "This case is not worth the urine of an Iraqi child." Saddam then said he had told his followers "that if you see an American vehicle and you can strike it" but the judge turned off his microphones before the former president could finish. Earlier, Saddam told the judge that "if you were a real Iraqi, you would know that your country is going through extraordinary conditions." "We not only resist this occupation. We do not acknowledge it. We do not acknowledge all the decisions it has made, including appointing the so-called government and this court you represent," Saddam said. Abdel-Rahman interrupted, saying "you were not brought here against your will. Here's the medical report…and it indicates that you are in good shape." "I didn't say I was ill," Saddam snapped back. "I was on a hunger strike." During his remarks, Saddam also objected to having a court-appointed attorney deliver the summation on his behalf. "Where are your lawyers," the judge asked. "They're staying abroad in front of the TV screens and inciting violence. Those are lawyers? Having millions of dinars? Listen Saddam Hussein, your lawyers have millions of dinars and are inciting violence." As the court-appointed lawyer began to speak, Saddam interrupted him. "You are my enemy. Who appointed you?" he asked. "I challenge you to read this on your own. He probably didn't even write this. The American agent, the spy probably wrote this for him." During the summation, the court-appointed lawyer, whose identity was kept secret for security reasons, said the documents and witnesses presented by the prosecution did not tie Saddam personally to any killings and torture of the Dujail Shiites. "Instead they refer to 'Saddam the tyrant,' 'Saddam the killer' ... and such references that reflect being written by people who are not impartial," the lawyer said. "The documents lack any details when it comes to a specific role for Saddam in Dujail in 1982. There is no proof that when he was president he visited Dujail after the assassination attempt. there's no proof he was there when the detentions happened," the lawyer added. After the lawyer finished, Abdel-Rahman told Saddam he was free to make his own statement "but not political speeches." "You talked about politics on this podium and talked about the people being killed," Sadda, said before the judge told him to be silent. Saddam then sat down and complained that the closing argument was prepared by "a Canadian," in an apparent reference to foreign legal experts who closely follow the trial. "The closing argument was prepared by the Canadian so that the lawyer was stumbling while reading it for the first time. It is based on Rwanda and Yugoslavia. It is not based on the Iraqi law, not even a litter bit. Regrettably, Iraq is being insulted to this point?" Saddam said. The session then adjourned until Thursday. With Saddam, the court has heard six of the eight final summations. After the final one is presented, the court will adjourn to consider a verdict, possibly in mid-August. Saddam is due to stand trial Aug. 21 in a second case, the bloody crackdown on Iraqi Kurds in the 1980s.